Away from the popular areas along Blue Diamond Road and the scenic loop drive, most of Red Rock Canyon NCA is only lightly visited, despite having comparable scenery. Such is the case towards the south end of the preserve, which although crossed by busy Highway 160 and accessed by several trailheads, is not often explored. One good hike starting along this road is the 8 mile round trip to Mountain Spring Peak and Little Zion; the former is a 6,641 foot summit, the highest point in the Spring Mountains for several miles north or south, while the latter (an unofficial name) is an elevated bowl of colourful, stripy sandstone, thought to resemble the higher regions of Zion National Park in Utah. The route climbs quite steeply for the first mile, by just over 1,000 feet, then is fairly level as it follows the mountain ridgeline north, past several lesser summits in addition to the high point, then descends a stony ravine to the edge of the slickrock expanse of Little Zion. The trail to the peak is fairly well-defined, and although it becomes fainter beyond, the way ahead is usually obvious, following the mountain crest. Besides offering fine views of the desert lowlands to the east and other hills to the west, the path is enlivened by eroded, rocky formations, all composed of jagged limestone, dull grey in color. At Little Zion there are no major formations apart from a thick sandstone arch, but for an area of about one square mile the sparsely wooded slopes are dotted with many sandstone outcrops weathered into pleasing shapes, and are crossed by little ravines, so several hours could be spent walking around looking for photogenic features. Some parts are steep, and the basin contains sheer cliffs in addition to the sometimes deep ravines, but it is still relatively easy to move around. The hike overall is moderately strenuous and takes four hours or more. Little Zion can also be reached from the east via Rainbow Spring Road, an unpaved track branching off Lovell Canyon Road, but this may need a 4WD vehicle and the hike is generally less interesting, with a similar elevation gain, more restricted views and only a slightly shorter distance (by about one mile), hence the southern approach is preferred. Red Rock Canyon NCA map, topographic map of the trail. 28 views of Mountain Spring Peak and Little Zion. The trailhead along Hwy 160 is not signed, but has plenty of parking spaces, in a clearing in light woodland, on the north side of the road. This point is half a mile southeast of the center of Mountain Springs village, and a 20 mile drive from the Red Rock Canyon park headquarters. From the parking area, at least four gravel tracks head further into the woods; the hike is along the main one, which starts off due north, veers east to cross a small drainage then divides; the right fork climbs steeply up a sloping ridgeline to the base of a communications tower, a possible alternative parking place. From here a path continues, also ascending steeply, to a sparsely vegetated high point (5,827 feet) and down slightly into a wooded basin. Once past the tower, all the surrounding land is part of the Rainbow Mountain Wilderness Area. The wide trail rises once more, to a bench, and proceeds along an eastwards-trending ridge, where an old burn area can be seen to the west. The route continues climbing up to the main mountain crest and soon allows the first glimpse of Las Vegas far below, visible through a gap between cliffs. Also coming into view are several outcrops of the reddish-yellow Aztec sandstone that forms most of the eastern face of the Spring Mountains, as all the exposed rocks so far have been the grey limestone. 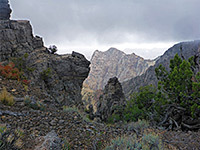 The trail becomes much less steep, sometimes nearly flat, as it passes just beneath an intermediate summit, right across another and finally reaches Mountain Spring Peak after 2.4 miles, a rocky place with a few twisted, wind-blown trees. 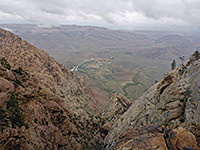 The northwards continuation path is fainter, staying on the ridgeline as it descends to a saddle, and curves round above a steepening line of cliffs to the east, up to another jagged summit (6,516 feet), with views now of Little Zion ahead, and of other sandstone formations in the distance. 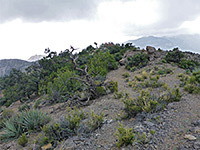 While mostly covered by pinyon and juniper pines, the mountain slopes are also home to a good variety of wildflowers, cacti and other desert plants; most abundant are agave utahensis, which grow in small clusters, and also banana yucca and the mound-forming echinocereus triglochidiatus. Little Zion is reached by a sharp descent, down a narrow path that crosses patches of loose stones so is rather slippy, eventually coming through some bushes and out to the edge of the smooth, orange and yellow sandstone, which in some places is crossed by thin, pinkish-red bands. The floor of the sandstone bowl is another 450 feet below. 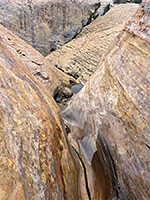 The basin is drained by two main washes, one in the south, descending in a series of falls and potholes, the other to the west, generally wider and less steep; this has some of the best stripy formations, towards its lower end. The colors and textures of the sandstone are better defined when the rocks are wet. 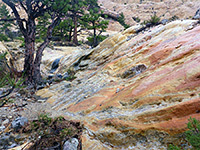 Ponderosa pine trees line some of the streambeds, another feature shared with Zion National Park. 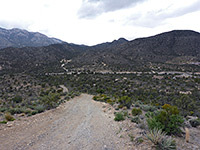 The two drainages meet just before the edge of the basin; beyond is a high pour-off as the ravine tumbles down the mountain slopes, high above Bonnie Springs. 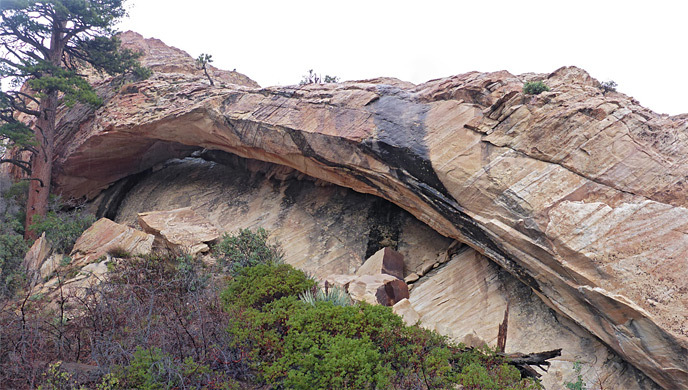 The arch at Little Zion has formed along the north edge of the northernmost drainage, and its opening, although long, is narrow, the span lying close to a cliff just behind, so the feature may not be so easy to locate unless close-up..